The families of service members with Hawaii ties who were killed before Feb. 28 in Iraq and Afghanistan will receive Hawaii's first Medal of Honor. Theresa Inouye of Oahu will be there, wearing the heart-shaped locket her son gave her. Marybeth LeVan of Louisiana will be attending with family members gathered from two mainland states. Color: Yellow and Red, symbolizing the Hawaiian monarchy -- red for courage and strength and yellow for the honor the recipients have demonstrated. » Circle of Kalo leaves -- Represents ohana. » Coat of Arms -- The shield, eight bars representing the Hawaiian Islands, kapu or puloulou sticks as emblems of authority and protection. » Star -- Recognizing Hawaii as the 50th state and the honorees of the award. » Maltese Cross -- Represents the four axes of the globe with Hawaii as the crossroads of the Pacific. And Tina Witkowski of Puyallup, Wash., will be there with four family members also. The three women, who come from different states but share a common tragic bond, are among about 200 people expected to be at the state House chambers Tuesday to honor 120 service members with Hawaii ties who were killed before Feb. 28 in Iraq and Afghanistan. They are among 48 families who will receive Hawaii's first Medal of Honor at a rare joint session of the Legislature, which begins at 10 a.m.
"It's honorable for the state to recognize soldiers who gave their lives for a worthy cause," said Inouye, whose son, Sgt. Deyson "Dice" Cariaga, was killed in Iraq by a roadside bomb on July 8, 2005, while serving with the 29th Combat Brigade. "The importance of what they did should not be lost," she said of the soldiers who sacrificed their lives. The medal, approved by state lawmakers last year, is believed to be the first in the country issued by a state honoring service members killed during the wars in Iraq and Afghanistan. Service members who were residents of Hawaii, stationed in the islands, attended colleges here, or were members of the Hawaii National Guard when they died will be honored. The only Hawaii civilian to die in Iraq -- Maui's Wesley Batalona, who was one of four American contractors brutally killed in Fallujah in 2004 -- did not qualify under state law. State Rep. Mark Takai, co-sponsor of the House bill last year and an officer in the Hawaii Army National Guard, said 200 family members from Hawaii, the mainland, Guam, Saipan, and American Samoa are expected to attend. "This resolution and the actions we have taken will honor soldiers like Sgt. Cariaga and parents like Theresa Inouye," said Takai, who served as the casualty assistance officer to the Cariaga family while he was on active duty last year with the Hawaii Army National Guard. "The Hawaii Medal of Honor is a symbol of our remembering those who stood tall for our values so that we may live in a land perpetuated in righteousness," added Sen. Norman Sakamoto, chairman of the Senate Education and Military Affairs Committee. 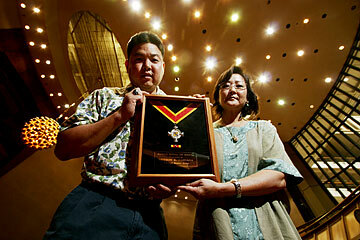 Rep. Mark Takai and Theresa Inouye, mother of Sgt. Deyson Cariaga, who was killed in Iraq, held the new Hawaii Medal of Honor in the House Chamber at the State Capitol Friday. Sakamoto was part the committee, which also included Rep. Ken Ito, and Maj. Gen. Bob Lee, state adjutant general, that coordinated Tuesday's ceremonies. The award was designed by Sgt. 1st Class Aaron Pollick, historian for the Hawaii Army National Guard. 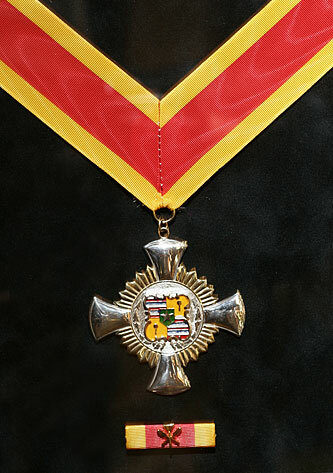 Festooned with a yellow and gold ribbon, the medal features the state coat of arms and the Maltese Cross, which depicts four axes of the globe, representing Hawaii as the crossroads of the Pacific. The medals cost about $100 each and are being made by the Honolulu Mint. Members of 48 families paid their own way to attend the ceremony and receive the medals. Takai said Lee, working with the heads of the National Guards in other states, plans to use National Guard members to deliver the Hawaii medals to those people who won't be able to be here. Lee and Brig. John Ma, who commands the Army Reserve in the Pacific, also will deliver the medal to families in American Samoa. Family members who are attending are touched by the state's gesture. "Our family is honored and touched by what your Legislature has done," said LeVan, of Baton Rouge, La., who lost her son, Marine Cpl. Kyle Grimes, in a helicopter crash in Iraq on Jan. 26, 2005. "It is the only state to honor Kyle with a medal. It is such a personal thing ... so helpful and a blessing." LeVan will be accompanied by her husband, Steven; her daughter, Jackie; and her sister-in-law, Debbie Smith and her husband Ken and their daughter Melanie. Grimes was one of 27 Marines from Kaneohe's 1st Battalion, 3rd Marines, killed in the helicopter crash, in the western Iraqi desert, the deadliest single event in the Iraq war for U.S. troops. LeVan said her son was buried in a family plot in Bethlehem, Pa., where he was born and raised. For Witkowski, the trip to honor her husband will be a bittersweet return to the islands, where she lived as a teenager. "I have a lot good friends in Hawaii that I made while my dad was stationed here" at Pearl Harbor, she said. Spc. Philip Witkowski was killed in Afghanistan May 1, 2004, while helping to mount a machine gun on a Humvee. He was assigned to the 25th Infantry Division's 7th Field Artillery and had been in Afghanistan for a week. "I am really honored," she added, "now my sons have something to look back on and be proud of their father and what he did."